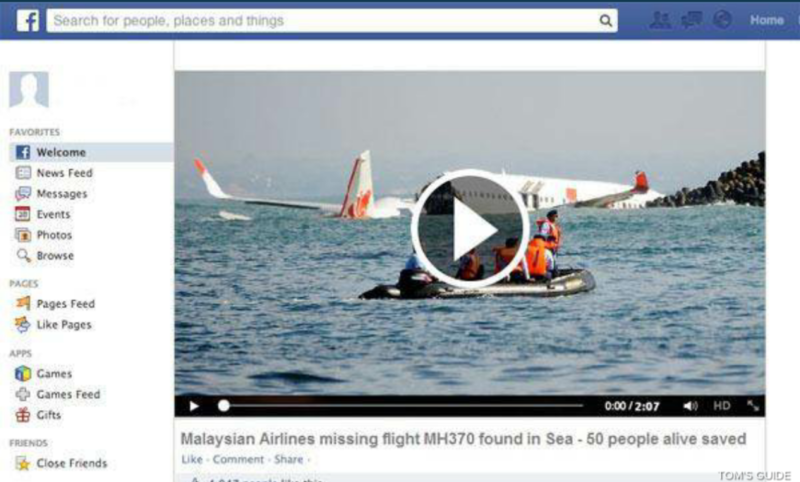 Missing Malaysian Airliner Scams Pop Up On Facebook. Bogus news stories and videos about the vanished Boeing 777 are appearing on Facebook and Twitter. But anyone who clicks on the video to get new information about the missing passenger jet will be giving up some of their personal information to scammers. There have also been spam tweets leading to a fake facebook page entitled ‘Malaysian Airlines missing flight MH370 found in sea, 50 people alive saved.’ The headliners are accompanied by photos of plans floating in water, but the images are of past events. For instance the January 2009 Miracle on the Hudson water landing of a disabled US Airways Airbus A 320 in New York City, and the April 2013 water landing of a Lion Air Boeing 737 that miss the runway in Bali, Indonesia. Neither crash had any fatalities. Anyone who clicks on the videos will be disappointed. None of the videos play, instead would be viewers are asked to verify their ages, invited to fill out brief surveys and share the video with Facebook friends. Share this information with your friends so they do not get their personal information stolen by these hackers.